Trevor Immelman came back to win the 2008 Masters Tournament. Despite scoring a double bogey on the 70th hole, the par 3 16th, Immelman finished with a score of 8 under par, beating favorite Tiger Woods by three strokes. Angel Cabrera is an Argentine professional golfer who plays on both the European Tour and PGA Tour. He is a two-time major champion, with wins at the U.S. Open in 2007 and the Masters in 2009; he was the first (and only) Argentine to win either. 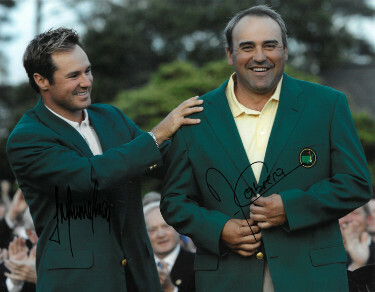 Trevor Immelman and Angel Cabrera have hand autographed this 11x14 Photo. Certificate of Authenticity from Athlon Sports Collectibles.